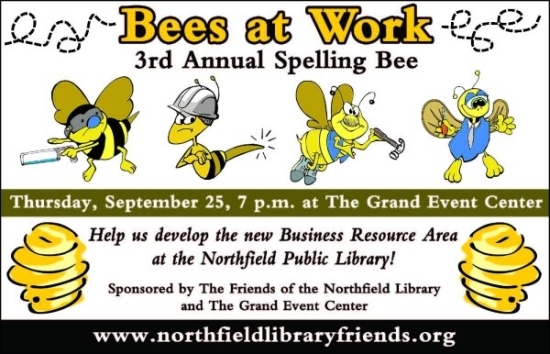 The buzz surrounding the Friends of the Library’s Third Annual Adult Spelling Bee begins. This year’s bee will be held next Thursday, September 25th, 7 p.m., at the Grand Event Center. The theme for 2008 is Bees at Work, and proceeds from the bee will go toward expanding the library’s business resource area. Hey, talk about increasing Northfield’s business-friendliness! Will Healy will be emcee for the event again this year. Paul Zorn, who was a member of the winning St. Olaf team the past two years, will serve as pronouncer for the event. Finally, the other teams will have a chance! If you’d like to compete as a team, sign-up sheets are available at the library reference desk, the Friends of the Library web site, or by calling 645-6566. Otherwise, it’s a great spectator sport. So come on down(town) for the Bee!